A table presents data as a scrolling, single-column list of rows. Use a table to display large or small amounts of information cleanly and efficiently in the form of a list. Generally speaking, tables are ideal for text-based content. Use the TableView Inspector to customize its properties. The inspector where the TableView class can be configured. Several UI aspects can be configured in the TableView class but Template, DataSet, and the Cell Properties (Text, Detail Text, Image) are the most commons to be configured. Template: The TableViewCell used as the template that will be duplicated to create every single row of the TableView. DataSet: The source of the data presented by the TableView. It must be an object that implements the DataSet specs, for example Assets, Databases, HTTPClient (REST), BTCentral, Location, Motion and many others. KeyPath: The TableView can present only lists of data, so the DataSet must return an object of type List or a RecordSet. If the DataSet is representing complex hierarchical data (see the treeData property of the DataSet class), for example a JSON object returned by an HTTPRequest, the KeyPath property defines the base keypath used to extract a List object from the self.value property of the DataSet. Text,Detail Text, Image and custom properties exposed by the configured CustomView (if any): The database column or the keypath, depending on the type of the DataSet, used to retrieve the data for each property of the cell from the value of the DataSet at a specific index. The appearance of the content of a TableView can be customized by tapping the subnode icon (+). Available subnodes in a TableView. Header: An accessory CustomView that is displayed above the table. Footer: An accessory CustomView that is displayed below the table. Cell: The template used to create one TableViewCell instance for each row (the number of rows and the data for each row is provided by the DataSet). You can add more than one Cell subnodes, but only the Cell set in the Template property of the TableView is used. Basic: An optional image on the left side of the row, followed by a left-aligned title. It’s a good option for displaying items that don’t require supplementary information. Subtitle: A left-aligned title on one line and a left-aligned subtitle on the next. This style works well in a table where rows are visually similar. The additional subtitle helps distinguish rows from one another. Right Detail: A left-aligned title with a right-aligned subtitle on the same line. Left Detail: A right-aligned title, followed by a left-aligned subtitle on the same line. None: Don't use any built-in field, the content must be presented by a CustomView subnode. Background: Background color of the cells. Alternate: Background color of the cells at odd indexes. If not set, the Background is used. Custom View (optional): A CustomView added to the TableViewCell. 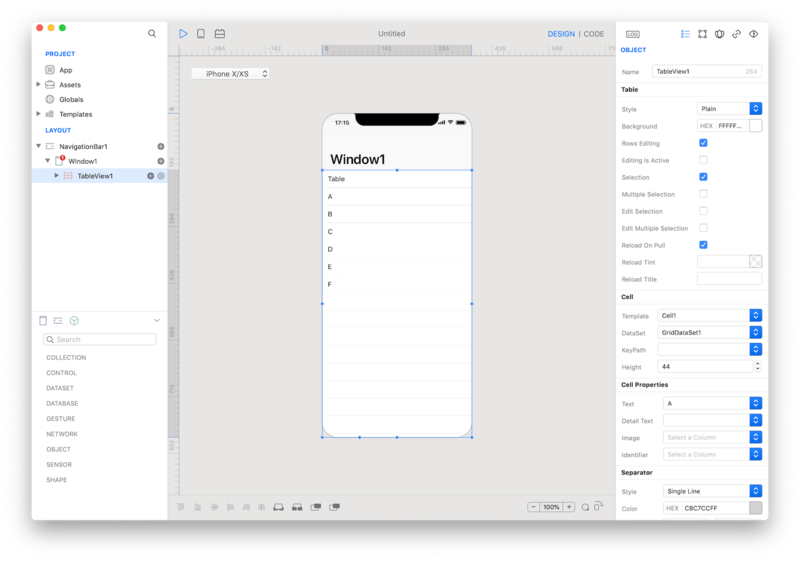 The CustomView is resized with the size of the TableViewCell. You can use a global CustomView from the Templates folder or the CustomView subnode of the TableViewCell. The exposed properties of the CustomView are presented in the Cell CustomView Properties section of the TableView's inspector, use the inspectors to configure the DataSet's column/keypath for each property. Left Action: Add a TableViewRowAction object. When the user swipes horizontally to the right in a row, the table view moves the row content aside to reveal your left actions. Tapping one of the action buttons executes the action of the TableViewRowAction. Right Action: Add a TableViewRowAction object. When the user swipes horizontally to the left in a row, the table view moves the row content aside to reveal your right actions. Tapping one of the action buttons executes the action of the TableViewRowAction. 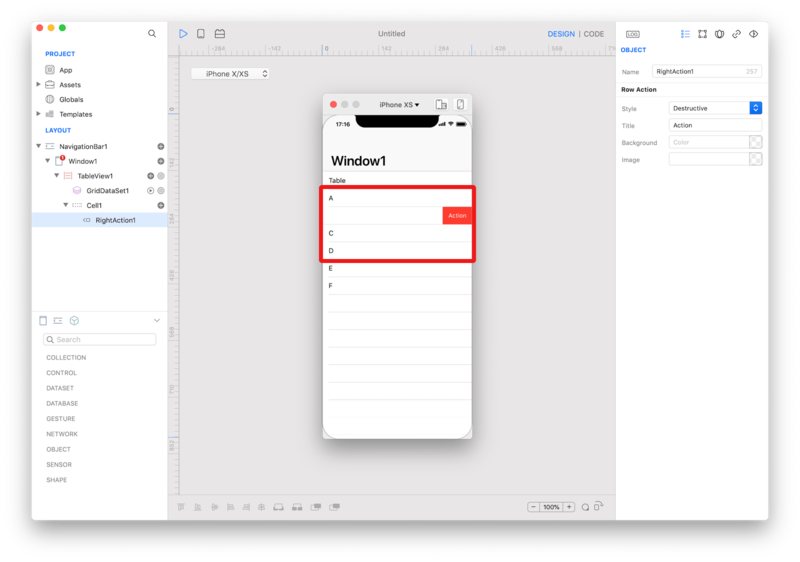 _ Custom View: Add a CustomView that can be used for the Custom View property of the TableViewCell. An example of a TableViewCell with two right TableViewRowAction. Drop some images from the system Finder to the Assets folder. Set the Assets value in the DataSet property from the inspector of the TableView1. Set the Name value in the Text property from the inspector of the TableView1. TableView class reference contains a complete list of properties and methods that can be used to customize a TableView object. TableViewCell class reference contains a complete list of properties and methods that can be used to customize a TableViewCell object. TableViewRowAction class reference contains a complete list of properties and methods that can be used to customize a TableViewRowAction object. ToDo tutorial contains an example on how to configure a TableView object and how to open a detail Window for the selected row. Lets Cook Navigation tutorial contains an example on how to configure a TableView object and how to open a detail Window for the selected row.